Mega Infernape in game: 172 Who? Important notice! Pokemon Mega Infernape is a fictional character of humans. Infernape (Japanese: ????? Goukazaru) is a dual-type Fire/Fighting Pokémon introduced in Generation IV. It evolves from Monferno starting at level 36. It is the final form of Chimchar. 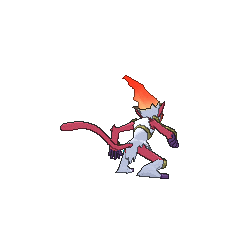 Infernape is a bipedal, primate-like Pokémon that is primarily reddish-brown with sections of white fur on its chest, head, and lower legs. Several gold markings adorn its body: swirled, circular ones on its knees and shoulders flame-shaped ones on the back of its hands, and a stripe around its back that forms two swirls on its chest. On top of its head is a large flame, which is never extinguished. 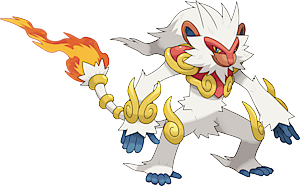 Infernape has an orange, rounded muzzle, long, round ears with blue inside, and a red ridge over its eyes. The eyes themselves are blue with yellow sclera. There are five blue digits on both its feet and hands, and it has a long tail. This quick Pokémon practices a unique kind of martial art that involves all of its limbs. This style uses fiery punches and kicks as well. Infernape made its official debut in the episode Fighting Ire With Fire! when Ash's Monferno evolved. 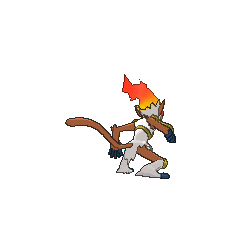 An Infernape belonging to Flint appeared in the episode Flint Sparks the Fire!. Infernape made its first appearance in The Rise of Darkrai, under the ownership of Allegra. It battled against Brock's Croagunk, and alongside Maury's Torterra and Kai's Empoleon to stop the consequences of Dialga and Palkia's battle. It was later used in the Alamos Town Pokémon Contest, where it helped Allegra win a Ribbon. DP163 Infernape Dawn's Pokédex Infernape, the Flame Pokémon and the evolved form of Monferno. Infernape's fiery crown reflects its fiery nature, and its speed is unmatched. Pearl owns a Chimchar named Chimler who later evolved into a Monferno, and then into an Infernape. 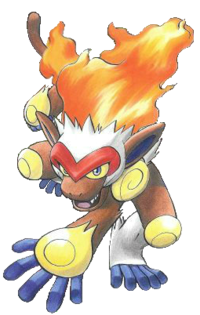 Infernape is the final form of Mitsumi's starter Pokémon, Chimchar. It made its debut in Beauty Contest: The Pokémon Super Contest! !, where it represented its Trainer in a Beauty Contest. Yu Shirogane has an Infernape which he received as a Chimchar. Infernape appears in the background in the Kalos Pokémon League stage. It appears in the Blazing Chamber along with other Fire-type Pokémon, namely Tepig, Blaziken, and Pyroar. NA: Infernape's flames burn like a raging inferno - that's probably how it got its name. The fire on its head never goes out, and the flames on its hands and feet, combined with its unique skills, make Infernape look like it's performing some kind of elaborate fire dance when it fights. PAL: Doesn't the name just conjure up images of this fair creature living a peaceful life in a forest of ferns? You know, In-fern-ape. ...What, you think it's actually to do with "inferno"? Hmm... Well, maybe... Anyway, it has a crown of fire that never goes out, and combines flames and fighting in a way that looks like some kind of fire dance. It uses unique fighting moves with fire on its hands and feet. It will take on any opponent. Moves marked with a superscript game abbreviation can only be bred onto Infernape in that game. It spits blobs of fire to attack. It also has an explosive attack. Infernape came to the Lava Zone to battle. He likes to cut loose at Venusaur's Vine Swing, Tangrowth's Swing-Along, and a few other Attractions, too. 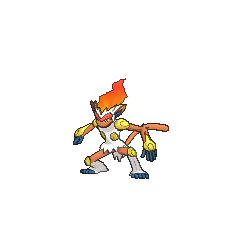 For other sprites and images, please see Infernape images on the Bulbagarden Archives. Infernape is the only final form Sinnoh starter Pokémon not to have an immunity, since Empoleon is immune to Poison-type attacks and Torterra is immune to Electric-type attacks. Infernape shares its category with Charmeleon, Charizard, Flareon, and Moltres. They are all known as the Flame Pokémon. Infernape is the only fully evolved starter Pokémon who has no base stats that are divisible by 5. Infernape is the shortest fully evolved starter Pokémon. 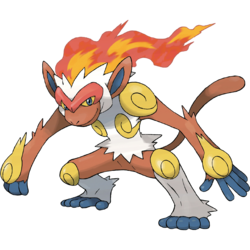 Infernape is based on a monkey. The gold elements in its design as well as its Japanese name are most likely linked to Son Goku, the Japanese interpretation of the character Sun Wukong. Sun Wukong is the main character in the Chinese epic Journey to the West and is a monkey with powerful abilities. It is also similar to the Vanara, a race of ape-like humanoids in the Hindu epic Ramayana, specifically Hanuman who was granted immunity to fire. Hanuman is also believed to have influenced Sun Wukong. It is most likely based on the martial art Muay Thai which uses all the limbs and possibly Monkey Kung Fu, another type of martial arts. It may have also be loosely based on Crazy Monkey Defense, a boxing style that incorporated elements from other martial arts such as Muay Thai. 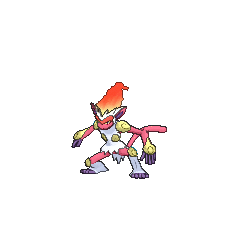 Infernape is a combination of inferno and ape. Goukazaru is a combination of ?? goka (hellfire or inferno) and ? saru (monkey). Mandarin Chinese ??? Lièyànhóu Literally "Raging flame monkey".